“IF WE want things to stay as they are, things will have to change.” The words, uttered by a Sicilian aristocrat on the eve of Italian unification in Giuseppe Tomasi di Lampedusa’s classic “The Leopard”, neatly sum up the sentiment at NETmundial. The big internet-governance powwow held in São Paulo on April 23rd-24th brought together 1,200-odd participants, including government officials, boffins, representatives of NGOs and business from 97 countries. Most shared a desire to prevent the internet's break-up. This, many believe, requires an overhaul of the way it is run. A few months ago fragmentation seemed a real threat. Dilma Rousseff, Brazil’s president (pictured), talked of bypassing internet services based in America. Angela Merkel, Germany’s chancellor, came out in favour of a separate European internet. Both were peeved at America’s National Security Agency, which had spied on their e-mail, among other things. Ms Rousseff convened NETmundial last September in response to these revelations. In her welcome speech she deplored mass surveillance. It is ironic, then, that NETmundial underlined a convergence between Brazil and the United States, notes Ronaldo Lemos, an internet lawyer and academic. In inveighing against online snooping at NETmundial, Ms Rousseff did not finger the United States directly. More telling, the shindig’s emphasis on “multistakeholderism” (politics speak for the idea that decision-making is not left solely in the hands of governments) signals that its host finally broke with the other BRICs, which have long insisted on a greater role of nation states in running the internet, Mr Lemos says. In 2012 Brazil had sided with Russia, India and China by signing a renegotiated version of the International Telecommunications Regulations (ITR), the international treaty which has governed communications between countries since 1988. America and its allies rejected the new ITR because they felt the agreement risked handing too much power over the internet to the United Nations, where authoritarian regimes hold greater sway than in the loose coalition of public and private entities which keep the internet humming along nowadays. Much to America’s delight, Brazil has not ratified the treaty and instead decided to host a “multistakeholder” meeting. That, combined with the US Commerce Department’s decision last month to relinquish its oversight of an important part of the internet’s address system, managed by the Internet Corporation for Assigned names and Numbers (ICANN), may prompt other countries to follow in Brazil’s footsteps. Little wonder that the United States delegation called the São Paulo meeting “meaningful and constructive”. If NETmundial has made it plain that most of the world thinks the internet is too important to be left to governments, it made little headway in how to run it. Here Lampedusa’s spirit was less in evidence: for all the grandiose talk of “a new beginning” in internet governance, the conference’s “outcome document” was a tacit acknowledgement that the web works rather well as things stand. It was peppered with phrases such as that the internet “should be preserved as” or “continue to be” stable, unfragmented, fertile, open and so on. As Rafal Trzaskowski, Poland’s minister in charge of information technology, puts it, "any changes must preserve the principle of 'do no harm'.” Vinton Cerf, one of the internet’s founders and now the vice president of Google, was blunter. “Don’t screw it up,” he implored the high-level committee which drafted the summit’s concluding document on the basis of hundreds of submissions received prior to and during the proceedings. The existing model, composed of global and regional bodies charged with technical and policy matters, springing up as needed in a bottom-up fashion, has allowed the web to grow one-million-fold in 20 years, Mr Cerf reminded the panel. It would be a mistake to hand control of it to some overarching, rigid institution, even if it is not under the sway of governments. That would be inimical to the internet’s protean nature. Better to grapple with problems as they emerge, in ad-hoc groups of existing organisations. Much as nowadays, in other words. Specifically, says Mr Cerf, once the Americans cede their oversight of the internet’s phone-book, which they would like to do before September 2015, ICANN ought to be left alone altogether. Milton Mueller, a noted internet scholar at Syracuse University more critical of the US government’s handling of ICANN than Mr Cerf is, agrees. He quips that replacing the commerce department with some “multistakeholder committee”, itself in need of supervision lest it be captured by vested interests, would be a step towards “an infinite regress”. So long as ICANN works in a well-defined, open and accountable way, Messrs Cerf and Mueller see no reason to impose external supervision. As if on cue ICANN’s boss, Fadi Chehade, told the conference that next week his organisation will begin public consultations on how to achieve this goal. In practical terms, such tweaks do not smack of a revolution. So does the web really need a Lampedusan overhaul? Today the internet certainly creates room for abuse, in the form of digital vandalism and crime, as well as mass surveillance, which was largely absent in the early days, when the net “used to be just geeks”, Mr Cerf says. Now that cyberspace has grown much bigger and much less homogenous, he explains, governments’ reflex reaction is to shield their netizens from mischief-makers, as they do offline. This is understandable—and desirable, if it means sorting out things such as digital property rights or common assurance that both ends of online transactions are equally secure from prying eyes, private or state-sponsored. But it could be dangerous if they try to ensure security, and indeed protect human rights online, by subverting the properties which have made the web so successful. Fortunately, the final NETmundial declaration steers clear of that pitfall. The non-binding document stipulates that human rights must be observed online as much as off, but also that the properties which have let the web blossom must be preserved. The “roadmap” for how to achieve these lofty goals is predictably thin on specifics, but at least it does not vest responsibility with governments alone. It does make a non-committal nod to some concrete ideas such as the one, supported by Mr Mueller, to separate ICANN’s policy-making from the day-to-day operation of the “root file” of the internet’s domain-name system, which could be devolved to regional registries. It also calls for the Internet Governance Forum, a “multistakeholder” talking shop convened by the UN in 2006, to be shored up by extending its five-year mandate, which expires in 2015, and guaranteeing “stable and predictable funding”. Unsurprisingly, no one was completely happy the result. Russia, Cuba and, to a lesser extent, India, decried the declaration for undermining governments’ role. (China had expressed similar sentiments throughout the event though not explicitly after it concluded.) America was queasy about its condemnation of online eavesdropping. NGOs complained this did not go far enough. They would also have liked to see stronger support for “net neutrality”, the principle that all internet traffic be treated equally. This is contested by many internet service providers, another “stakeholder”, keen on the freedom to charge different services differently for bandwidth. Mr Mueller, the academic, warns that such declarations “tend to create the illusion that important social benefits come from political demands” rather than enforceable rules and incentives. Brazil was a big winner. The event went off without a hitch, though the five hours devoted to set-piece speeches by nearly 30 national delegations and representatives of the other sectors could probably have been used more productively. 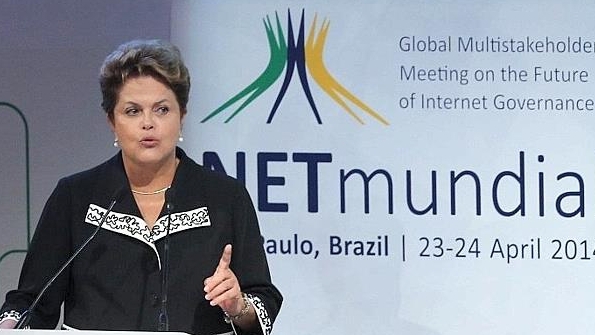 Ms Rousseff basked in universal praise as she signed into law her country’s own “internet bill of rights”, which enshrines principles of online privacy, freedom of expression, as well as net neutrality, and was passed by the Senate the night before NETmundial got cracking. Most important, NETmundial did nothing to harm the current set-up of internet governance. Work on specific regulations will continue. Many, including Tim Berners-Lee, the British inventor of the world-wide web, see the marco civil as a useful template for a global accord. Mr Cerf and Mr Chehade, together with other web bigwigs, plan to publish their blueprint next month. And, though no declaration can prevent determined regimes from trying to regain sovereignty over their own national bits of the internet, at least the NETmundial statement does not hand them a justification. Correction: An earlier version of the article suggested that China had criticised the outcome document explicitly. It had not, though its delegates had expressed scepticism about the multistakeholder approach throughout the event.